Hip Hop legend Nas kicked off his 40th birthday at TAO Beach on Saturday. Arriving with a group of friends, he enjoyed lunch while drinking Dom Perignon and Hennessey cocktails. He was surprised by friend and fellow hip hop artist Busta Rhymes who came to say happy birthday. The two hung out in the cabana, laughing and singing along to the sounds of DJ Jerzy. Thrilled at the presentation, Nas was then treated to his second birthday cake of the weekend accompanied by a parade of large pool floats. He took photos with the treat adorned with a crown and Mets logo and was later seen tasting it with friends. “All Gold Everything” rapper Trinidad Jame$, who also spent his day at a VIP cabana poolside, later came over to say happy birthday. Nas’ group stayed until 5pm then left to get ready for the big fight. Later that night, TAO continued Nas’ 40th birthday festivities with a post-fight party. Headlining the evening, Nas arrived in a Waraire Boswell designed gold and black suit and enjoyed dinner with friends in TAO Asian Bistro’s private dining room. 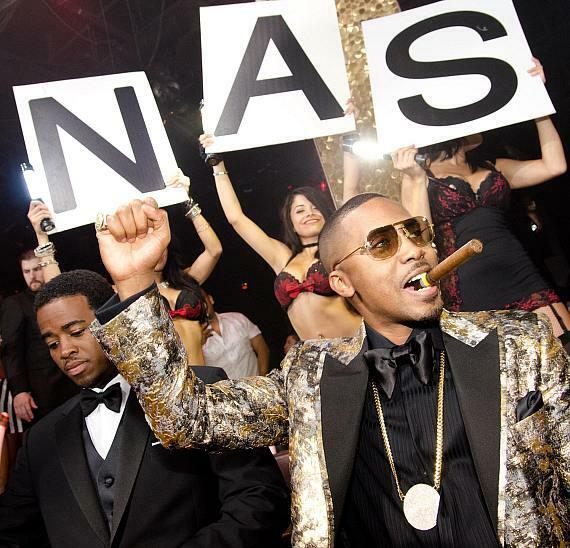 The group then took over a VIP section in the center of the club where a custom graffiti wall of Nas’ name was displayed over the dance floor. Flashes filled the space and fans cheered as DJ Vice announced his arrival. Soon afterward, TAO put on a giant birthday presentation that featured a special showcase from professional b-boy dancers and a cake replica of the Queens Bridge. Late night after some Hennessy and Dom Perignon drinks, Nas jumped on the mic and thanked everyone for coming, stating, “I’m 40” while chuckling. He encouraged club goers to “live [their] life to the fullest, don’t stop and take it all the way.” DJ Vice then dropped a medley of his songs including “If I Ruled the World,” “Hate Me Now” and “The Don,” which he rapped along to. Busta Rhymes, who dined at TAO Asian Bistro earlier that night, took over a VIP table next to Nas. Busta made sure to wish Nas a happy birthday and toast with the crowd to his career, professing his love and admiration for the legendary lyricist as well as dubbing the title of “King of New York.” He then got the entire room to scream “Happy Birthday Nas” before treating the packed room of hip hop fans to his verse from “Scenario” alongside Nas. Downing half of a bottle of Hennessey, Busta then rapped along to some of his hit songs before the royalty duo treated guests to a few tunes before getting back to partying. At 4 am, Busta got back on the mic and took the crowd through a catalogue of Nas’ greatest hits, schooling them on real hip hop.